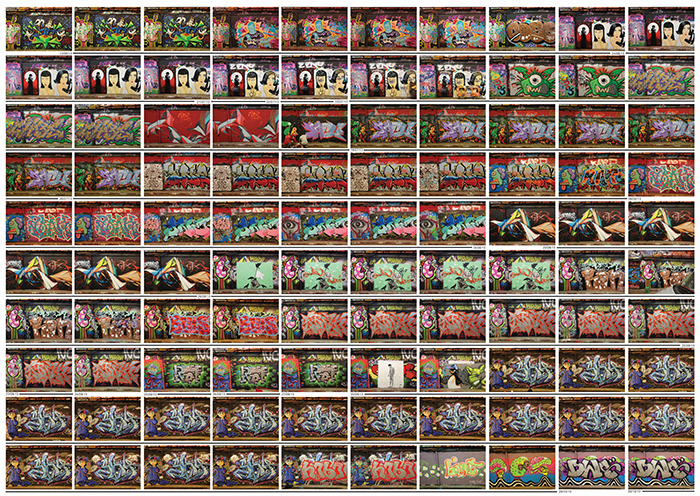 This poster shows the transformation of a graffiti wall over 100 consecutive days. The wall is located in Leake Street, a legal graffiti spot located in a tunnel underneath London's Waterloo station. This photographic project illustrates the almost daily changes a wall goes through in this place, showing the multitude of skills and techniques used by graffiti writers. Look closely and you will notice how subtle changes from one day to the other alternate with more drastic, complete changes of colour and vision. All images and text copyright their artist/author and MAY NOT be used for any purposes without the express permission of the original artist/author. All Rights Reserved, 2013.